Stand by Me was the first film Sutherland made in the United States. He played the neighborhood bully in this coming of age story about the search for a dead body. Sutherland has appeared in more than 70 films, most notably Twin Peaks: Fire Walk with Me, A Few Good Men, Flatliners, Young Guns, The Vanishing, The Three Musketeers, Eye for an Eye, Dark City, A Time To Kill, and The Sentinel. The actor is also a frequent collaborator with director Joel Schumacher, and has appeared in The Lost Boys, Flatliners, Phone Booth and the big screen adaptation of A Time to Kill. In The Lost Boys, Sutherland was reunited with actor Cory Feldman, who he had previously worked with on Stand by Me. In 2005, Sutherland was inducted into Canada’s Walk of Fame in Toronto, where both of his parents have also been inducted. In 2009, he was awarded a star on the Hollywood Walk of Fame. Sutherland was the first Inside the Actors Studio guest to be the child of a former guest; his father, Donald, appeared on the show in 1998. Sutherland was featured on the cover of the April 2006 edition of Rolling Stone, in an article entitled “Alone in the Dark with Kiefer Sutherland.” The article began with Sutherland revealing his interest to be killed off in 24. However, he stated, “Don’t get me wrong. I love what I do.” It also revealed that he devoted 10 months a year working on 24. He has starred in Japanese commercials for CalorieMate, performing a parody of his Jack Bauer character. Sutherland also provides voice-overs for the current ad campaign for the Ford Motor Company of Canada. In mid-2006, he voiced the Apple, Inc. advertisement announcing the inclusion of Intel chips in their Macintosh computer line. He also voices the introduction to NHL games on the Versus network in the U.S. He has appeared in a Brazilian TV commercials for Citroën C4 sedan and a voice-over for a commercial for Bank of America. He voices Sgt. Roebuck in Treyarch’s video game Call of Duty: World at War and will voice Snake (aka Big Boss) in the upcoming video games Metal Gear Solid V: Ground Zeroes and Metal Gear Solid V: The Phantom Pain, taking over the role originally performed by David Hayter, as to provide an older voice to the aging character’s role. Sutherland is a celebrity producer of The 1 Second Film. In 2011, he made his Broadway debut, opposite Brian Cox, Jim Gaffigan, Chris Noth and Jason Patric in the Broadway revival of That Championship Season, which opened in March 2011. The show has since closed. Sutherland starred in the Fox television series Touch. Sutherland played the father of an autistic boy who does not like to be touched, while the son also communicates future humanity interrelated events to his father through numbers and mathematics. Since 2001, Sutherland has been associated most widely with the role of Jack Bauer, on the critically acclaimed television series 24. After being nominated four times for the “Outstanding Lead Actor in a Drama Series” Primetime Emmy Award, Sutherland won the award in 2006 for his role in 24’s fifth season. In the opening skit of the 2006 Primetime Emmy Awards, Sutherland made an appearance as his 24 character, Jack Bauer. He was also nominated for Best actor in a Drama Television Series in the 2007 Golden Globe Awards for 24. According to his 2006 contract, his salary of $40 million for three seasons of the show made him the highest-earning actor on television. Sutherland constantly emphasizes that the show is merely “entertainment.” The Dean of the United States Military Academy, Brigadier General Patrick Finnegan, visited the set of 24 in February 2007 to urge the show’s makers to reduce the number of torture scenes and Sutherland accepted an invitation from the U.S. military to tell West Point cadets that it is wrong to torture prisoners. In an interview with OK! Magazine, Howard Gordon says that it would be an “unbearable loss” if they killed off Sutherland’s character. On 14 February 2010, Fox TV announced they were temporarily suspending production of Season 8 of 24 due to a ruptured cyst near one of Sutherland’s kidneys. According to the report, he waited a few days before going in to have “elective surgery” performed. It was anticipated that he would return after a week, but a further few days was needed and Fox reported that his return to set would be 1 March. On 26 March 2010, it was announced that 24 would end at the conclusion of the 8th season, paving the way for the 24 feature film to go into production. Production was anticipated to begin at the beginning of 2011. 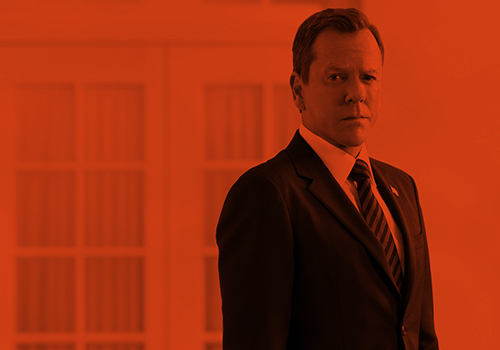 On 9 May 2013, Deadline.com suggested that Kiefer Sutherland is in talks with FOX to start a new, limited series of 24. On 14 May 2013, it was confirmed that the show will return for a limited series.